Patissier is a fun, hilarious, and very helpful Job in Bravely Second. They used baked good to cause various status ailments and enfeeblements. 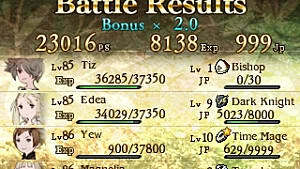 They are can also make the enemy focus on 1 party member, which is good if you have a tank to soak up damage. They can use items on everyone and cause their confections to target all enemies at once. If you like reducing your enemies' stats, and have a sense of humor, this Job is perfect for you. Unlocking Patissier - How to unlock the Job. 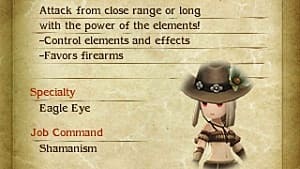 Equipment Guide - The optimal equips for this Job. Ability List - Each ability and when you get them. Cross Job Tips - Which Jobs work well with this one. Combat Tips - How to use this in battles. You unlock this Job by defeating Angelo in Yunohana at the end of chapter 2. 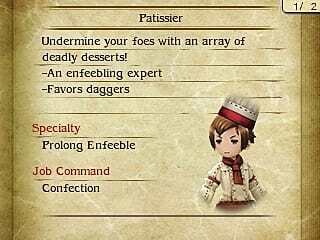 Patissier only has S rank in Daggers and C rank or lower in all other weapons. Light armor for the extra magic defense, plus magic attack if you are going to offensive as well. Equip a shield in your off-hand if you want more defense. Dagger, particularly the Falcon Knife since it increases speed. Rods if you want to also do magic damage with a sub Job. The specialty for Patissier is Prolong Enfeeble. Prolong Enfeeble - Status afflictions inflicted by characters with this support ability will last for twice their normal duration. Bon Appetit - Gives access to a variety of confections to feed enemies. These will either lower their stats, cause status ailments, or make them weak to certain elements. Each one requires Confectionery ingredients. 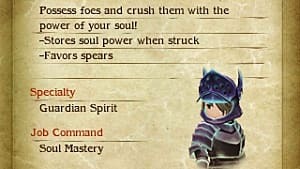 You can get these from using the Harvest ability, find them from battles or in dungeons, or buy them from the Adventurer once you've unlocked them from the moon base. Harvest - Gives Confectionery ingredients while in battle. You can do this multiple times, but items vary by location. Flambe - Unleash a fire attack that damages all foes proportional to each target's current BP. 0.5x - 2.0x damage. Decoration - Raises target's likelihood of being targeted by the enemy to the highest level possible for 10 turns. Status Ailment Amp (Support Skill. Cost: 1) - Chance of inflicting status ailments will be increased by 25%. Glace (Support Skill. Cost: 1) - The effect of consumable items that restore HP and MP will be doubled. Digestion - Removes Ghost status and any attribute bonuses on multiple targets. Prolong Enfeeble (Support Skill. Cost: 2) - Allows you to use the Patissier specialty when playing as other Jobs. Items for All (Support Skill. 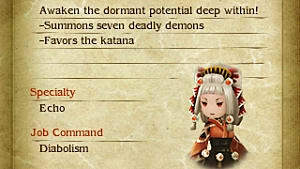 Cost: 2) - Consumable items and Bon Appetit abilities will affect all allies or enemies. Critical Hitter (Support Skill. Cost: 2) - Gives a 25% chance to score critical hits with spells and items, dealing double damage or doubling recover effects. The in-game description only says attack items, but I tested it and it works with recovery items as well. Piestorm - Toss 4 pies at random enemies with each lowering a different attribute (P.Atk, P.Def, M.Atk, and M.Def) by 25% for 4 turns. There are multiple things you can do with Patissier. Freelancer is great if you want to build on the Job's use of items. Freelancer's Waste Not support ability gives you a 50% chance to not consume items and it works with your Bon Appetit abilities. Catmancer is you want to use items to attack as well. Mixed with the Patissier and Freelancer support abilities, you can deal a lot of damage as well as heal very well using only items. 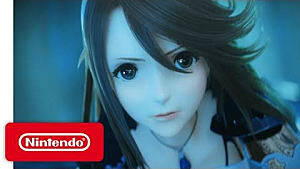 This makes it nearly the same as the Salve-maker Job from Bravely Default. Magic Jobs. Patissier has a high INT so you can use damaging or support magic as your sub Job to make it even more versatile. Patissier is all about crippling the enemy and supporting your team. Items for All is pretty much required since it lets you use those Bon Appetit effects on all enemies at once. 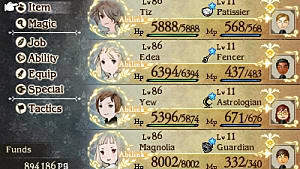 If you are using a tank in your party, this Job is useful even if you only use Decoration, since you can use it on the tank to give them the highest chance possible of being targeted. 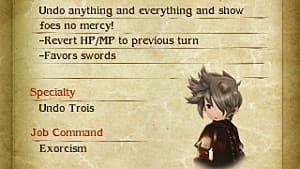 Patissier is also good for a healer or elemental damage dealer if you use Glace/Attack Item Amp and Critical Hitter since it greatly increases the effectiveness of items and gives you a chance to crit with them. 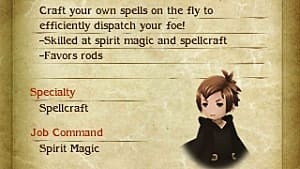 That's it for my Bravely Second Patissier Job guide. Let me know if you have any questions. Visit my Beginner Tips and Tricks for more help with the game.